You know, sometimes, naming a recipe is really not easy. 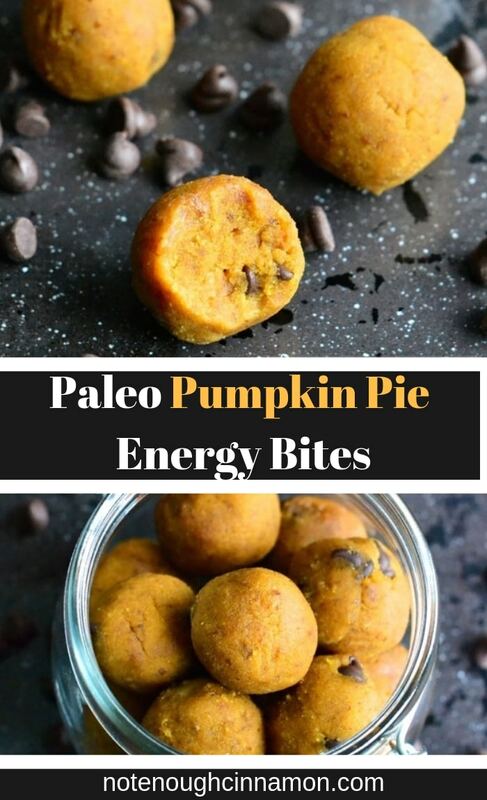 Like with these Paleo Pumpkin Pie Energy Bites -there are so many things you want to highlight and not enough words. Well, technically you can use as many words as you want but then your food blogger self-reminds you that you have readers and they need to actually understand what it is you’re trying to make them eat. And they need to find this recipe in the first place so you should try to make that name search-engine friendly too. 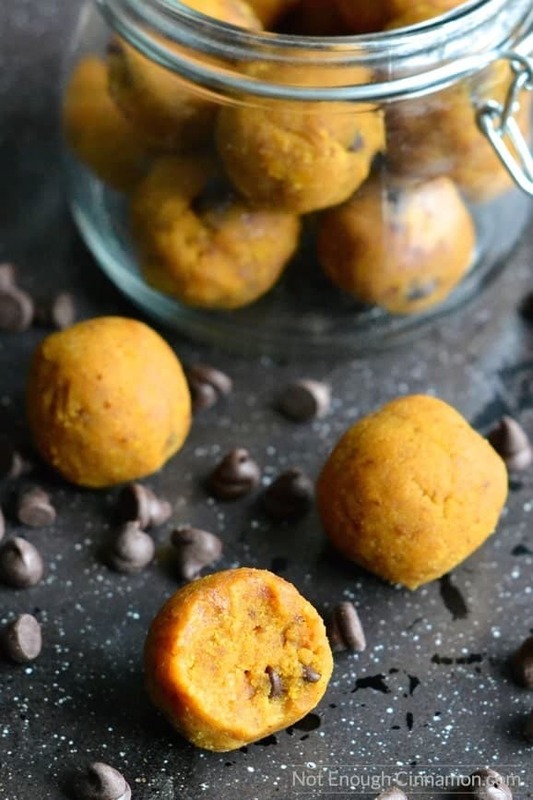 How does Easy 4-ingredient Paleo Vegan Healthy But Delicious Pumpkin Pie Chocolate Chips Cookie Dough Energy Bites sound? Yep…that’s what I thought! So I settled on Paleo Pumpkin Pie Energy Bites but you guys, let me tell you that this recipe scores on so many levels! The most important thing for us lazy-busy people: they are stupid easy to make. Your ingredients, in your food processor – done. Well ok, then you need to roll the paleo pumpkin pie dough into balls but that’s about it. I listed 15 minutes total time in the recipe box but you could be done in less than that. And did I mention that you only need 4 ingredients? Ahem, I’m kind of lying here but I figured cinnamon and ginger are pantry staples so I don’t need to count them? Please? Ok so make it 4 or 6, you choose. In both case, pretty short list! But really, what we actually care about is how good these Paleo Pumpkin Pie Energy Bites are, right? To be honest with you, I made this recipe 4 times before sharing it with you because I wanted them to be perfect. 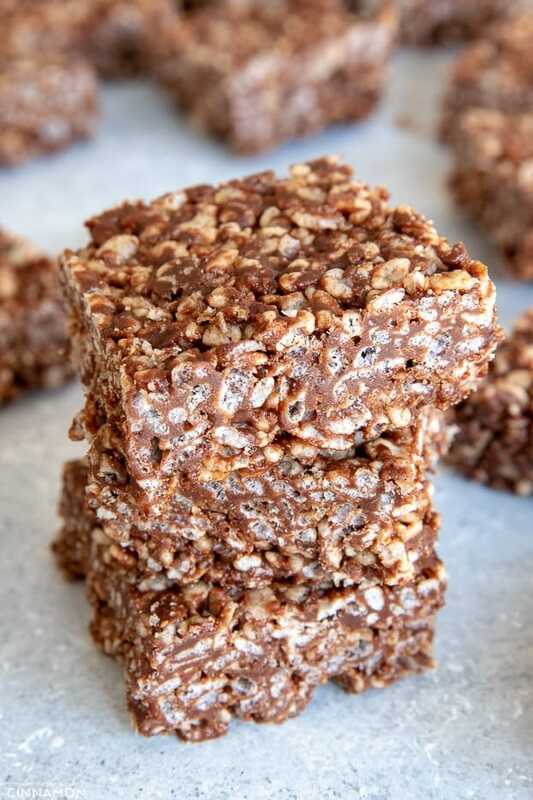 I tried these energy bites with oats and I just didn’t like the chewy/grainy texture. Then I tried them with almond meal. Good, but not exactly what I wanted just yet. And finally, the winning ingredient for these Paleo Pumpkin Pie Energy Bites was coconut flour! I love how it gives this great texture half-way between fudgy and cakey. Oh and then, I threw in some chocolate chips, just because…why not? If you tried these Paleo Pumpkin Pie Energy Bites, don’t forget to rate the recipe below and let me know how it went in the comments – I love hearing from you! 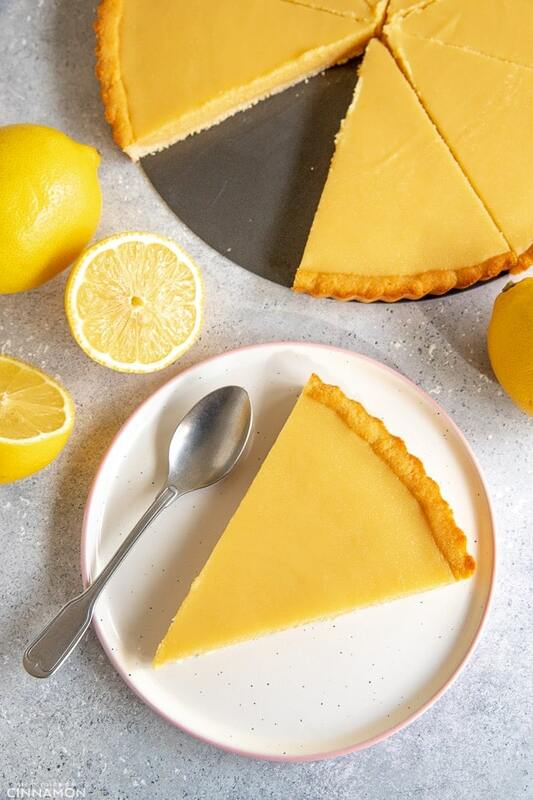 You can also follow me on Instagram, Pinterest, and Facebook for more deliciousness and behind-the-scenes! 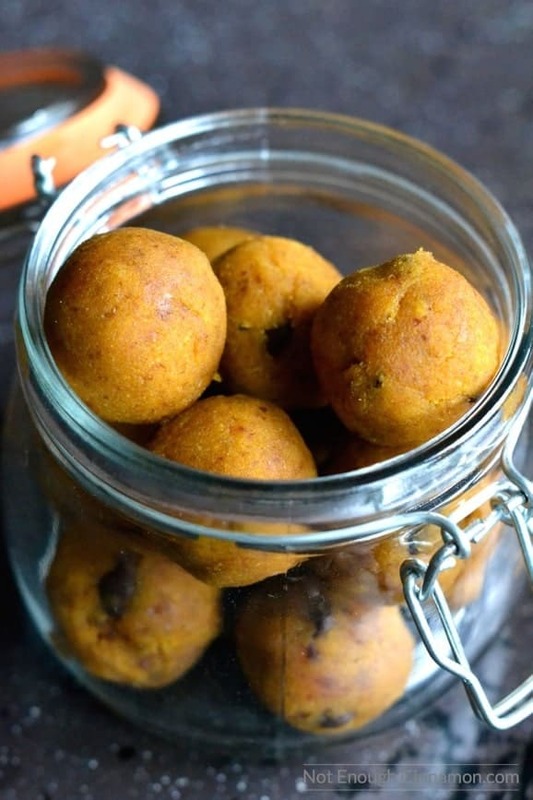 You only need 4 ingredients and 15 minutes to make these easy Paleo Pumpkin Pie Energy Balls. 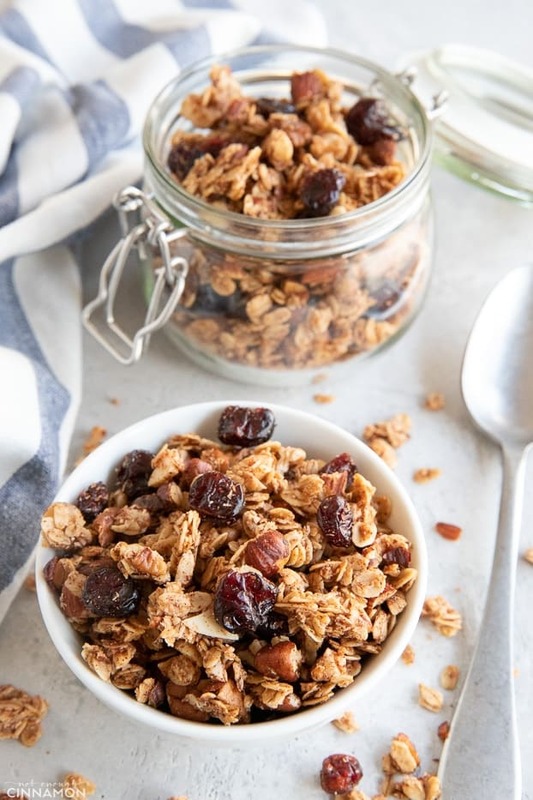 The perfect healthy Fall treat or pre-workout snack! Add dates to the bowl of your food processor and pulse until they form a paste, scraping the edges of the bowl with a rubber spatula as needed. Add pumpkin puree, coconut flour, cinnamon, and ginger. Pulse until the ingredients are combined. Add chocolate chips and mix with a spoon or spatula until well distributed. Roll mixture into balls (about one tablespoon each) and eat! Keep leftovers in the fridge. Big Announcement! – Goodbye Sydney, Hello New Life! 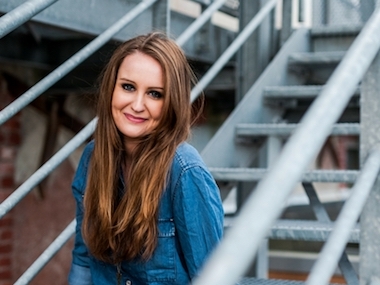 So glad Eat Yourself Skinny introduced me to your blog! 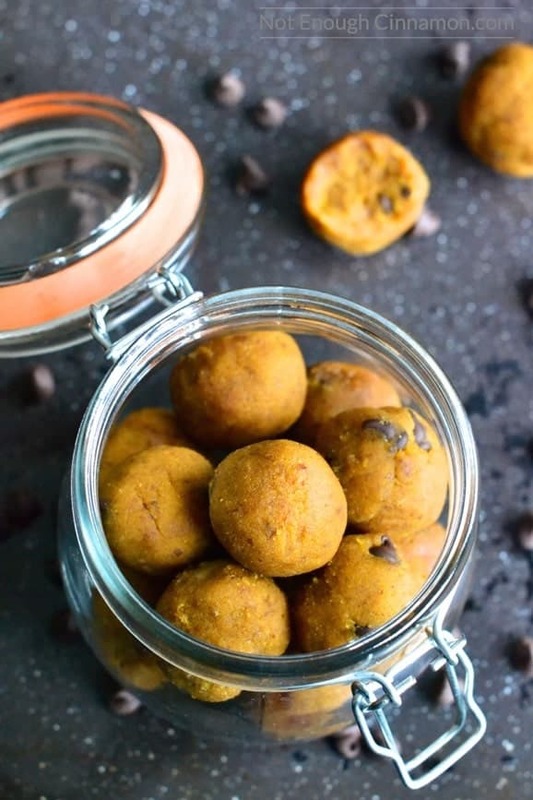 These pumpkin pie energy bites look delicious! Thank you so much for your recipes. I have made quite a few. I have liked them all a lot. This one has to be one of those that becomes more loved each time one makes it. My friend wanted a pumpkin surprise for his birthday. This was perfect. I will let you know what he says. Good luck on your new adventure. Welcome to the North American Continent. I hope you enjoy your stay here. I’m so happy to hear that Barbara, thank you!! 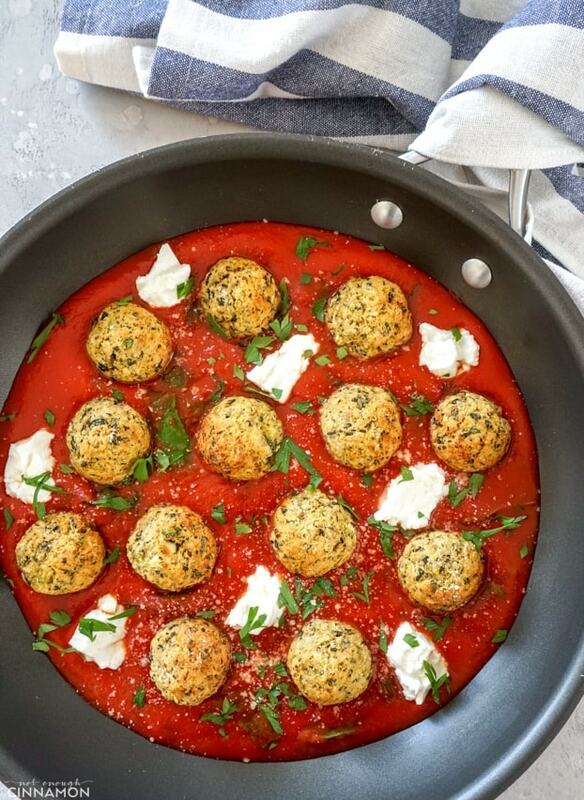 Made these last night – I love how easily things come together in food processor! But I COULD NOT get these to roll into balls. They just kept coming apart in my hands. So I took the whole mixture and pressed it into the bottom of a waxed paper-lined glass dish and cut into squares this morning. Pretty tasty! My issue was that they were too crumbly to roll. I did soak the Medjool dates beforehand, but next time I won’t pat them quite so dry. I’ll let you know how it goes! Yes, would love to 🙂 Thanks Jenn! Sorry I just thought of one more thing…do you think these would freeze well? I’ve never tried but I definitely think they would freeze well yes! I have been looking for a recipe like this but that has the added protein of a nut butter and maybe some seeds. Can you suggest a recipe that includes these? I can’t really think of a recipe with these additions, but you could try adding nut butter and seeds to this recipe! With the addition of nut butter, the batter might be a little bit too runny so you might have to add a little bit more coconut flour if needed. Thank you Barbara, I hope your friend enjoyed them! The color alone looks super tempting and the addition of chocolate chips just takes these to the next level! LOVE!